Early American was the first pattern printed in 22-karat gold. 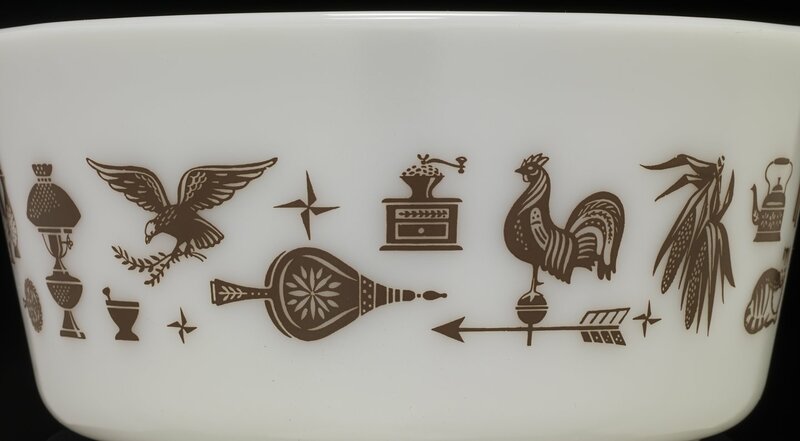 Early American is one of the longest running PYREX patterns. The same pattern was released in Canada, but was called Early Canadian. Early American was touted as “the most popular decorating theme of the decade.” A September 1962 article in Home for Daily read “Available after Oct. 15, the four-piece set will become a permanent item in the Pyrex line. Retail price is $4.95. The Early American decoration is in Colonial brown and 22-karat gold.” Early American was a resounding success, lasting for nearly a decade before it was discontinued in 1971. Along with Pink Gooseberry, Turquoise Butterprint, and Sandalwood, Early American was the fourth design released on the new and popular Cinderella Bowl sets. Its early release saw the design on Decorator Casseroles (943-7 and 945-7), a divided serving dish with cover (963-7), and a casserole in a brass mounter with walnut handles (6262). As it ran for nearly a decade, Early American was released on a full array of dishes featuring a Chip N’ Dip set (395-7), a three-piece casserole set (480), the three-piece Bake, Serve N’ Store set (470) as well as on a carafe and mugs with candle warmer set (4712-CW-4). Early American was offered in a gold on brown background or a brown on white background, but there were exceptions in this set. The large 1 ½ Qt. refrigerator casserole (503) was made with a white design on a brown background, as were the 401 and 403 bowls, potentially made for an alternating pattern set. Experimental color schemes only released for test marketing or as a prototype exist in such color schemes as gold on red, gold on turquoise, and gold on deep yellow or orange. The very same pattern was sold in Canada, but called Early Canadian, and was still produced in the United States. Early American ended its long run in 1971.